Salads can definitely fill you up. This one, bulked up with the ancient grain farro — a Mediterranean staple since Roman times — will leave you more than satisfied. Loaded with ingredients common in Greek dishes, like sweet-hot pepperoncini, briny Kalamata olives, salty feta, and fresh vegetables such as zucchini and cucumber, it’s not just filling but incredibly flavorful, too. And if you’ve never cooked with farro, it’s easy. Just rinse it before and after boiling to keep it from clumping. Look for the dense, chewy, nutty-flavored grain in your local supermarket (typically in the rice and grain aisle) in one-pound bags. Or buy it in bulk at health-food or warehouse stores. Purchase pearled or semi-pearled farro — it cooks faster. This ancient grain has been around since as far back as 20,000 years ago, and has recently enjoyed a new surge in popularity. It’s high in fiber, full of complex carbs, and has a dense, chewy structure. Prepare farro according to package directions, then rinse. Brush zucchini and pitas with Red Wine Vinaigrette. Grill zucchini, covered, until tender, 5 minutes, pitas until toasted, and lemons until browned. Slice zucchini halves into 1/4-inch-thick slices. 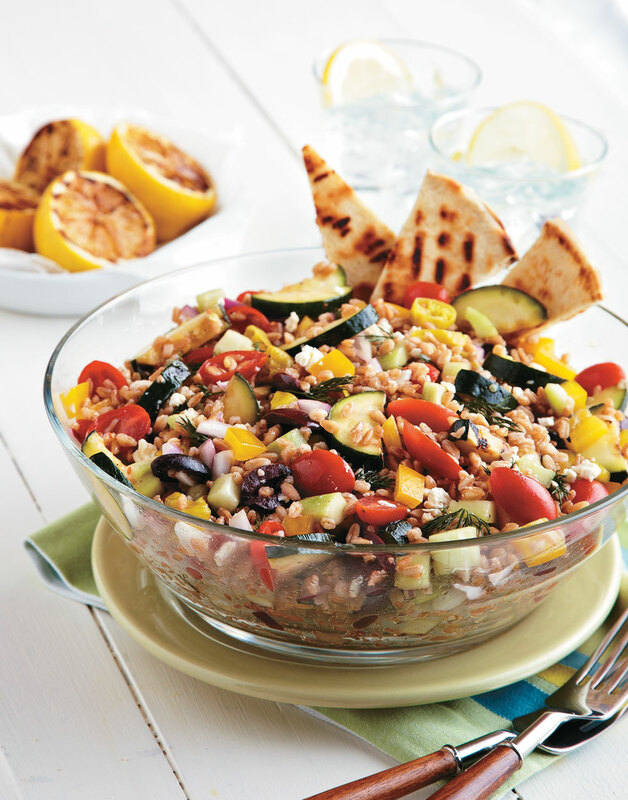 Combine tomatoes, cucumbers, bell pepper, dill, feta, pepperoncini, olives, and onion in a large bowl with farro, zucchini, and remaining vinaigrette; toss to coat. Cut pitas into wedges and add to salad. Serve salad with lemon halves. Rinse farro grains before cooking to remove starches and after cooking so they don’t clump together. For extra flavor and to prevent sticking on the grill, brush pitas and zucchini with the vinaigrette. Grill the pitas to crisp them, then cut into wedges that can be used to scoop up bites of salad.